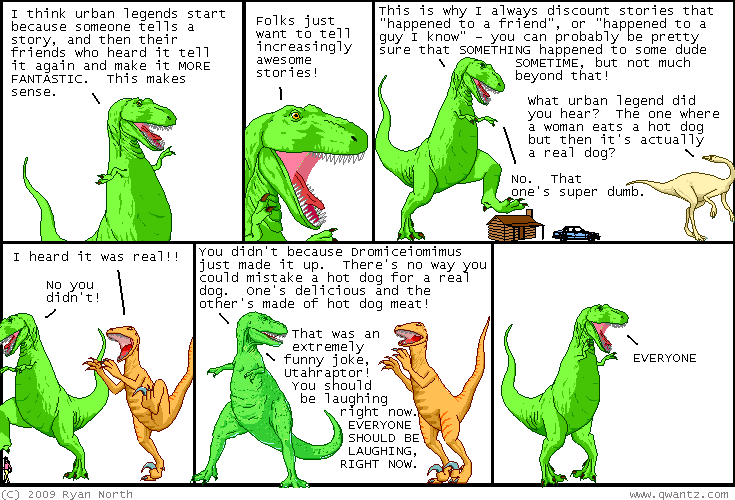 Dinosaur Comics - July 13th, 2009 - awesome fun times! July 13th, 2009: A few days ago I had a comic about the raspberry (fartnoise) sound not being a phoneme in any natural language, which Arnold Zwicky shared on the always-delightful Language Log. A reader of the site had emailed us both with a question, and when Zwicky responded I took the opportunity to thank him for the post and the shouts out, as I am not one to miss out on the chance to use an internal plural while emailing a professor of linguistics! This in turn inspired a post by Arnold on internal inflection, which I found incredibly valuable because it suggests the pluralization of hard on could be the amazing and stunning hards on. Should any of us ever find ourselves in a situation in which we must refer to a collection of boners, I certainly hope we'll remember to say, "You guys! What's with all the hards on?" The English language, ladies and gentlemen! SO AWESOME. One year ago today: this happened to me: i ran into Old My Friend Oliver outside my home, and he gave me the same mysterious inspirational nod. although his smile also could have meant "ryan, it's good to see you again, one last time. too bad how you died TOMORROW"